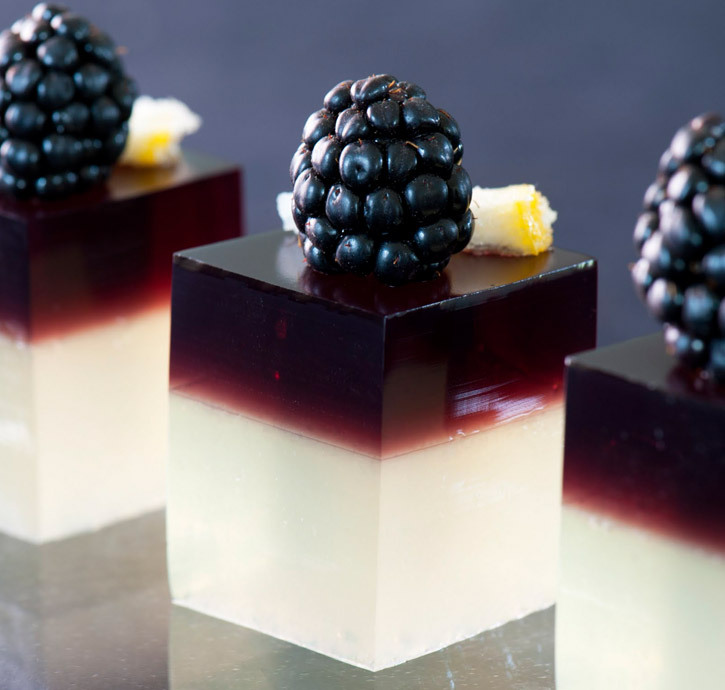 Gelatin is best known as a plain ingredient found in most home kitchens, but put in the right hands, it can be used to create fantastic modern dishes. Gelatin is derived from collagen from animals, usually pork. For a vegetarian alternative use Agar Agar. Gelatin sets when cold 15°C/60°F and melts at 25°C-40°C/77°F-104°F. Gelatin is available as powder, as gelatin crystals, as convenient gelatin sheets and as cold soluble gelatin powder. 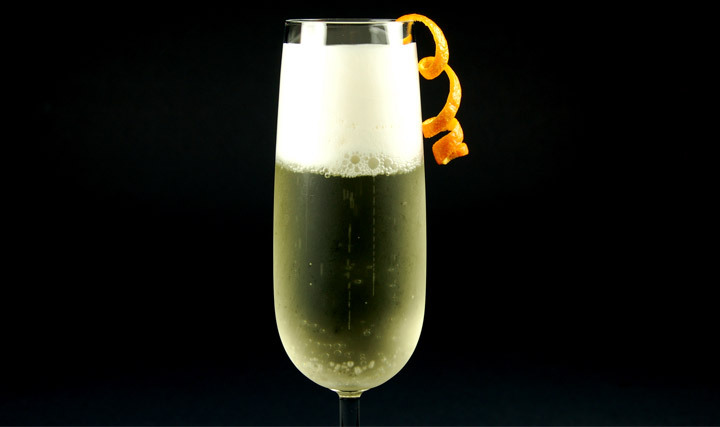 In modernist cuisine, gelatin is used to clarify stocks using the gelatin filtration technique, stabilize foams, make edible cocktails and much more. Gelatin is derived from collagen, a key component of connective tissue found in many animals. Gelatin is produced all around the world and is used for a number of industrial applications as well as in the food industry. Most gelatin in the world is produced from pork products. Since some religious do not permit the consumption of pork, fish has recently been used to produce gelatin as well. For a truly vegetarian alternative to gelatin, many turn to agar, an algae-based gelling agent. Gelatin is known by a variety of different brand names around the world. Gelatin is a gelling agent that is very easy to use to make cold gels but it is also used to stabilize foams. We've done quite a few recipes with gelatin, showcasing its versatility. Gelatin can make cold gels, even with alcohol content and can be used to stabilize foams. Below is a light, airy elderflower foam made with gelatin. You can also make thicker foams such as this coconut mouse-style foam which contains coconut cream fat but it is stabilized using gelatin. Gelatin is also great to make traditional cocktail jellies - yum! Below is The Bramble Cocktail Gel. 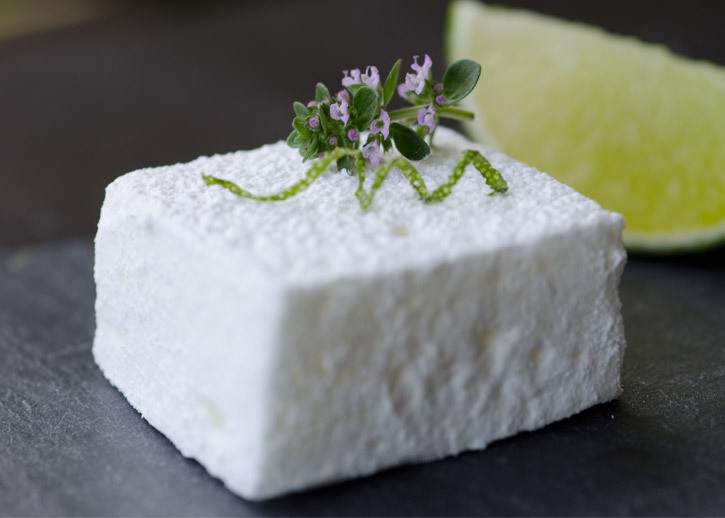 Gelatin is traditionally used to make marshmallows, here's our take on a cocktail marshmallow, a delicious Pisco Sour Cocktail Marshmallow. Temperature (gels and melts): Will hydrate at 50°C/122°F, but it's pretty standard to just boil it. Sets at 15°C/60°F, but sets much faster chilled, around 1°C/34°F. Melts between 25°C-40°C/77°F-104°F, depending on concentration. Texture: Forms a brittle, unstable gel. Mouthfeel: Melts in the mouth, which is why flavor release is excellent. Freeze / Thaw stable: No, syneresis caused by freezing. After defrosting they lose their smooth consistency and become brittle. Syneresis (weeping): Yes, both after freezing and at warmer temperatures. Shearing: Will not form a fluid gel. When blended, the gelatin returns to liquid form and will slowly re-gel. Hysteresis: Yes, in the range of temperatures between its setting and melting temperatures (see above). PH Tolerance: tolerates between 4 and 10 pH. Other Tolerances: Will gel in the presence of alcohol up to 40%, though gel strength decreases with increasing alcohol. Synergies with other ingredients: Transglutaminase will allow heat-stable gelatin gels to be made. Certain enzymes found in fruits such as pineapple, kiwis, mangoes or papaya will weaken the protein structures in gelatin gels. You should briefly steam these fruits or pour hot water over them prior to preparation. Gelatin is sold in three primary forms for food applications: sheet gelatin, gelatin crystals, and powdered gelatin. Powdered gelatin is also available in a cold soluble version (buy cold soluble gelatin). Sheet gelatin has traditionally been considered of higher quality, but in reality the strength of the powdered gelatin found in any supermarket rivals the strength of expensive sheet gelatins. 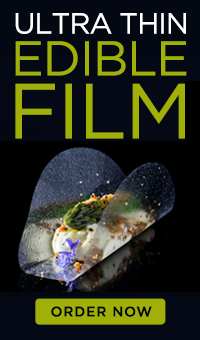 Gelatin sheets are still the preferred gelatin form for most chefs because sheet gelatin allows for the counting out of sheets rather than weighing powder, produces a clearer gelled product and has no odor. 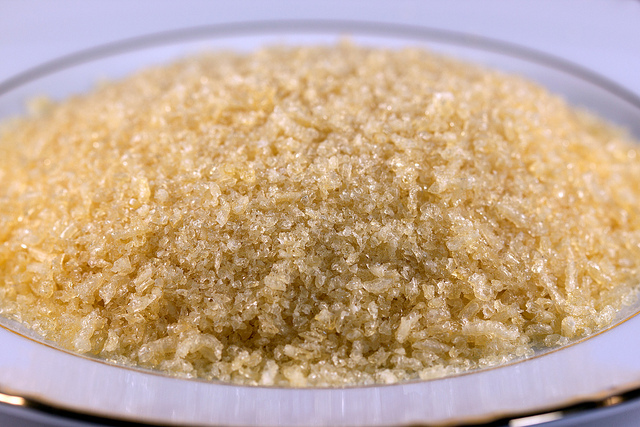 Sheet gelatin also reduces the chances of having undissolved granules in the preparation. The strength (and therefore quality) of gelatin is measured by the Bloom test. This test has nothing to do with "blooming" gelatin (more on that later) but rather is named after its inventor, Oscar Bloom. The higher the number, the stronger the gelatin. For comparison purposes, note that "gold" strength sheet gelatin is 200 bloom, whereas simple Knox brand powdered gelatin is 225 bloom. With that being said, Knox and other powdered gelatin producers do not advertise the bloom of their gelatin, as each batch may vary slightly. So, if you have a particularly precise application, leaf gelatin may be preferred. Regardless of what gelatin you use, always weigh out the gelatin, since the volumes of sheet, powdered, and crystals varies. There's no benefit to using higher bloom gelatin besides increased gel strength. It's perfectly acceptable to use more gelatin of a lesser bloom to achieve the same effect as using higher-bloom gelatin. Our convenient gelatin sheets have the same strength as Knox gelatin so you can easily convert from powder to sheets by weighing. Concentration Range: Gels are formed at concentrations ranging from about 0.5% to 2.0%. Dispersion: Disperse gelatin into cold water and allow to hydrate for 5 minutes. If using gelatin sheets, soak them in cold water until soft. Hydration: The thickened slurry (if using gelatin powder) or squeezed gelatin sheets should then be added to warm water (never boiling or the gelatin will lose its strength) to fully hydrate. Setting: To set a firm gel, chill to refrigerator temperatures. Sets at 15°C/60°F, but sets much faster chilled, around 1°C/34°F. Special uses: Clarification. It is possible to freeze gelatin and then let it thaw at refrigerator temperatures to intentionally induce syneresis in order to clarify cloudy liquids. 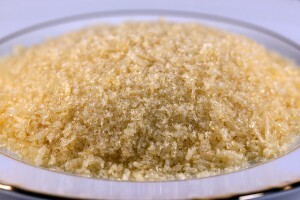 Learn more about gelatin filtration technique here. Gelatin has long been traditionally used to thicken stocks and create jellies. It can also be combined with other hydrocolloids to create unique textures.